A&B is a Snapchat marketing agency based in India & United Kingdom. We help brands build their Snapchat community and do great campaigns. We are proud to be one of the first and the best Snapchat marketing agency around. Snapchat users are consuming an enormous amount of content. To be precise, 10 billion videos per day. And the number of users producing this content is equally staggering, more than 100 million people use Snapchat with family and friends. Why? Because their moms, uncles, and aunts are on those platforms. And they like it even more because the snaps shared on Snapchat are self-destructible, meaning you have no proof whether it existed. 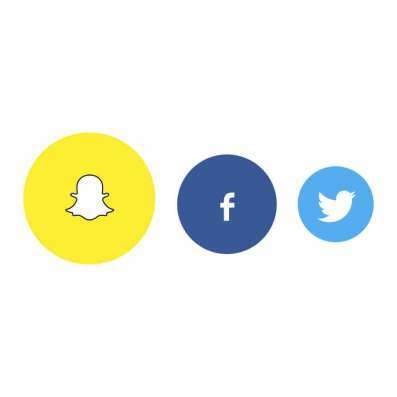 The millennials are joining Snapchat in the millions, how many followers does your brand have? Snapchat is the only platform for vertical videos and it delivers a great experience. The ad/content is a 10 seconder where the users can swipe up and explore more. Swipe up links to the advertiser's motive like long form video, website visit, article or mobile app install. Snapchat's swipe up rate is 5 times higher than the average click through on other social media ads/content. Snapchatters can take a snap at a brand's location which engages them with the brand and their friends. This is particularly useful for offline events where a large group of Snapchat users are present in an area and snapping about the campaign. In the USA, a sponsored Geofilter is used by 40-60% of daily Snapchatters. This feature is not available in India yet but it is expected soon. Snapchatters can take a snap at a brand's location which engages them with the brand and their friends. This is particularly useful for offline events where a large group of Snapchat users are present in an area and are snapping about the campaign. In the USA, a sponsored Geofilter is used by 40-60% of daily Snapchatters. This feature is not available in India yet but it is expected soon. Your brand on their face and they love it. Snapchat has gone a step ahead and literally put brands on its users' faces, but this is done in such a fun way that people love it. Some filters may even use a prompt like close your eyes to trigger an animation and then you can send it to your friends who get intrigued and try it. A Sponsored lens is used by a Snapchatter for 20 seconds on an average.